paul gregutt's washington wine blog – unfined & unfiltered: do washington wines age? It’s been awhile since I’ve written about the potential ageability of Washington wines. Beyond the occasional older bottle, what are the more general parameters for cellaring Washington wines? Do they last? Do they improve? Is it worth the time and risk, or like most domestic wines, are they best enjoyed while young and fresh? The short answer is yes. They are most often best enjoyed sooner rather than later. That said, quite a few age well, for varying time periods of course. In my experience, how long and if a given wine will reward cellaring comes down ultimately to some combination of grape variety, vine age, vineyard sources, vintage conditions and winemaking choices. For white wines, you need acid, or sugar and acid, to keep them for any length of time. Chardonnays, even the great ones, should probably be consumed with 4 – 6 years of release. I just had a 2006 Abeja chardonnay that was exceptional. Probably at or near its peak. That’s more the exception than the rule. Rieslings are most likely to last, and some dessert rieslings, such as the Ste. Michelle/Dr. Loosen Single Berry Select, don’t even begin to open up until a decade has passed. But let’s face it – it’s red wines that most of you are going to cellar. My own cellar is about 90% red. Not because I prefer red to white, but because I drink the whites sooner. Now that my entire wine cellar is under a single roof (for the first time in seven years), I can go in and pull out some well-aged Washington reds fairly frequently. Those experiences, along with extensive notes from many years of attending vertical tastings of older wines, has shown me which wineries are making wines most likely to age well. If you are drinking syrahs, merlots, or Rhône-inspired blends, the advice from here is to consume them within the first 6 – 10 years. Rarely have I had anything older that had done more than hung on. It is the cabernets, Bordeaux varietal wines, and Bordeaux blends that have the most potential for true longevity. In order to really test this theory out, obviously, time is required. How many Washington wineries have been making wine for more than a decade? More than 15 years? Even longer? Well – not many! When Walla Walla Vintners got bonded in 1995, they were only the 9th Walla Walla winery. I mention them because Myles Anderson and Gordy Veneri have held annual vertical tastings of their wines for the past several years, tastings that have been invaluable for showing how their wines age. The short list of Washington wineries with substantial track records whose older reds I have tasted often enough to evaluate would include Chateau Ste. Michelle, Columbia Crest, Columbia, Leonetti Cellar, Quilceda Creek, Walla Walla Vintners, and Woodward Canyon. Of course, there are many more wineries with decades of releases, but these are the ones whose vertical tastings I’ve been able to attend over the years. Of this very short list, I would have to say that the red wines of Ste. Michelle, Quilceda Creek, Walla Walla Vintners and Woodward Canyon have been the most consistently successful with many years of cellaring. Their older wines never disappoint, and often are thrilling. This past weekend, celebrating a friend’s significant birthday, I pulled out a few moderately-old bottles just to see how they were doing. We enjoyed them all – a 2003 Corliss Red, a 2003 Walla Walla Vintners Cabernet Franc, a 2000 Quintessa Napa Valley Red (ringer!) 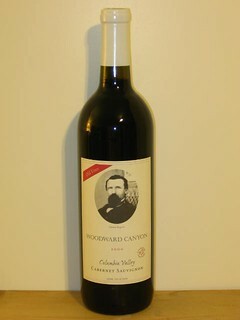 and a 2000 Woodward Canyon ‘Old Vines’ Cabernet Sauvignon. It was this last that made the strongest case for the ability of Washington reds to age with the structure, depth, flavor development and longevity of the greatest Bordeaux. This is not the first time that Rick Small’s reds have shown such muscle. But here again, the magic mix of old vines, a fine vintage, a Bordeaux variety and a winemaker whose style favors cellaring, proved that it was no fluke. I am surprised by your comment on the age-ability of Washington Chardonnay given your reviews of the Rulo verticals last year. Do you consider those wines a complete anomaly in the state? Thanks for writing on a topic that drives many wine enthusiasts nuts (me and a small group of friends opinion). I consider myself a reasonably well read WA wine fan (relying heavily on you and Sean Sullivan as well as the occasional WA story from Spectator or other mainstream media). I drink a bottle or 2 of mostly red/wk and have mostly WA reds in my cellar (read - 3 case wine fridge). I have had the (mostly) pleasure of drinking some of the bigger name WA reds in their various cabernet or merlot forms (admittedly no Quilceda Creek) and have been almost uniformly disappointed in any bottle, including from these "top tier" (based on your book and other expert reviews) WA producers that is >5 years from its release date. That includes many wines that the experts say require time in the cellar to reach their peak. Long story short, how much of this is personal preference vs how often do these wines really get "better". I almost always find that the fruit really disappears, sometimes leaving the tannins, oftentimes not, and the wine becomes very boring and one dimensional. Am I missing something? Am I doing something wrong? Because I am almost completely convinced that most wine makers are releasing wines that are ready to drink from the get-go and if you dont like them on day 1 dont invest $50.00 or more per bottle expecting them to improve based on the reviews. I have learned that mistake the hard way and at significant expense. Thanks again for a great write up on an important topic. Magnum, I'm painting in broad strokes here. But as far as Chards go, I don't think they improve after about 6 years. They certainly can last longer than that, but so what? SF - it's hard to do a meaningful analysis despite your thorough description. It may well be that you simply don't like older wines. Or it may be that you are drinking them when they are too old to be young, but still too young to be old. Wines can go into a bit of a 'dumb' phase - many of the Washington '07s are in one right now. You might also try decanting the old ones - give them a chance to breathe. Sometimes they take an hour or even longer to wake up from their years in the cellar. You are right that most wines are made and released to be consumed quickly. Because very few consumers drink them any other way! My tastes lean toward wines with some bottle age on them. I enjoy the complexity that comes with age, as well as the smoothing out of some of the tannin. I had a bottle of that 2000 Woodward Canyon Old Vines a year ago and thought it was delicious and just entering its plateau of maturity. With 2 left, I'll slowly meet them out and see how they fare; but I think they could see age 15 with no fear of any impending senility. Just as age-worthy and almost as good from the same vintage that I have had this year are DeLille Chaleur Estate and Betz Pere de Famille. At age 12 these two Cab-based BDX blends rocked. I am a big believer in the ageability of the better-made WA Cabs. Paul, I had the great opportunity to attend two reserve tastings at L'Ecole #41 over the past year. The first one featured a vertical of five Walla Walla Valley merlots. The older vintages, 1999 and 2004-5 (I think), were outstanding, and were considerably more interesting than the younger vintages. For the second tasting this past May, L'Ecole featured a vertical of similar years of their Columbia Valley Cabs. Once again, one of the earlier vintages (2004?) really did stand out from the pack. But the older merlots were the real gems of the bunch, when comparing both tastings. I should check my notes for the precise years featured in these tastings. Chris, I think you are right on target. The 2000 Woodie could probably go another decade. Chaleur and Betz are excellent candidates for similar lifespans, but I have not had enough experience with older bottles from those wineries to state that with any authority. Rick Small has been more than generous with tastings of well-aged Woodward Canyon reds over the course of the years. I will never forget a bottle of his first vintage - 1981 - that I had purchased upon release and drank at age 15 (the wine, not me!). It was a revelation. I've been pounding my fist on this topic for a while now. The Washington wines that were made 10-20 years ago had a lot more acid in them than their newer vintages. Go look at the pH levels for wines made in the 90s versus wines made today. A lot, and I mean A LOT, of WA Bordeaux wines are approaching or passing a pH of 4.0! At these levels wines are more susceptible to oxidation and spoilage. Many are being made to be "soft and approachable" upon release to help with sales to the uneducated wine consumers, but this comes at a price. Part of that price is that some wineries are purposefully not putting in the necessary amounts of SO2 for the pH level of their wines, probably due to the fear that the wines will smell and taste heavily of sulfites, which is very off-putting. This leaves them vulnerable to bacterial contamination and spoilage. The other price to be paid is in longevity. We opened up a 2008 bordeaux blend from a well-known Woodinville Warehouse Winery just last week and found that it was pretty much flat (or as the winemaker would probably say, "soft") with very little acid. It had great fruit flavor and a bit of tannin, but was otherwise uninteresting. I had one glass before dinner and then left it on the counter. When I poured another glass a couple hours later, it was already starting to show signs of oxidation. We recorked it, left it on the counter and the very next day it was completely spoiled. What a waste. It would not have been drinkable at 7-10 years of age. Moral of the story is that yes, older WA wines do age pretty well if they were made well, but there are not too many modern WA wines that will stand the test of time because, in large part, the acid levels are far too low and the pH is far too high. When available, I always check to see the pH of a wine before purchasing now. Good topic - one I think about often. I've wondered for years if Washington Cabs and Cab blends would emulate the Bordeaux or the California model for aging. Kind friends of mine with deep cellars have given me many, many opportunities for taste old vintages of both and what I've found generally is that the Bordeaux's change greatly and for the better while the California Cabs see their "fruit" dry out leaving the tannins. As you mention, Paul, there are just not that many examples of old WA Cab to evaluate, so I wonder: how does it age? One of my first Baby Poux Cabs, the 1998, from 8 year-old vines has begun an evolution and exhibits an aged Bordeaux-like character...in about half the bottles I open. The others are still primary in fruit character. It will be fun to watch and see what happens as the number of examples expands as the years pass. Those who have old wines and care to report, please do! Ed, thanks for the input! I am sorry I did not have a chance to attend those tastings. Jim, I think pH is definitely a factor, but it can be trumped by other factors. Plus, 99% of consumers will never be able to use pH as a metric. But SO2 is another issue, and you are quite right that levels at bottling are going down. Not necessarily a bad thing in my view. When tasting new wines I always leave the bottle out overnight if I think it has any chance of improving, and go back the next day. That is where the rubber really hits the road! Peter - time to do that vertical!! It would be great to have Bob Betz weigh in on this topic! I had a 2001 Clos de Betz recently, and although I didn't expect much, it was terrific. I'm not sure that many would have pegged it as a Bordeaux blend if tasted blind (the smoky qualities made it more Rhone-like), but no one was quibbling. A 1997 Columbia Red Willow Cab also got high marks from my personal tasting panel about a year ago. In general, though, my experience with older WA vintages has not been good; and every time I find one in my cellar, I get nervous rather than excited. One more data point to add to the discussion: We just had a 2002 Spring Valley Frederick (BDX blend, Cab dominant) that was fresh and vibrant and showing lots of legs for additional ageing. I would not put it quite at the same quality level as the Woody, DeLille and Betz I commented about earlier, but I think it says something about the ageability of the mid-tier from WA. Chris - very nice! Recall thatDevin Derby made that wine. I do not believe the recent, alcoholic, and super oaky wines will do as well. Thanks for the response. A couple of follow up questions for you based on your comments. "Or it may be that you are drinking them when they are too old to be young, but still too young to be old." - Fair enough, when do they get out of their teenage years? "Wines can go into a bit of a 'dumb' phase - many of the Washington '07s are in one right now." - This might explain why the 07s from some of my favorite producers have been a huge disappointment esp compared to the 06s which seem to be awesome at this point. When do you expect the 07s to get out of this "phase"? Funny how you describe these wines in a way that is very similar to kids. I agree the 2006 WA reds are showing well at the moment after being rather tough and tight in their youth. When wil 2007s open up? No way to know. I'll keep you posted! I am putting together a case of wine for a customer who would like it to age for ten years. She actually buries it under eight feet of dirt on her property in South Dakota! I am very much in agreement with most of the posts here; wine needs three things to age, fruit, tannins and acid. Had a bottle of 18 year old Martinelli Zin (Turley) the other day that tasted like it was just bottled!